For my family, Black Friday shopping is unnecessary and fun. We did it anyway, heading to Wal-Mart at 9:15 to get into clumps of people settled in around $2.84 waffle makers. Let me tell you, those people are crazy. Not regular crazy, like "My friend drives 50 miles an hour in the 45 zone" crazy. More like "I have a gun and will shoot you if you take that $18 Spiderman pillow from me" crazy. Well, I wanted a waffle maker. But I was going to be okay if I didn't make it out with one. The lady in front of me was not going to be okay. In fact, she was quite threatening. My brother was in the clump with me to help me get what I (and my sister-in-law) wanted. He is an outgoing person, and he made a lot of jokes about how everyone was so intense for something so silly. That lady couldn't stand it. She leaned back to her friend and said, "That boy's been mouthin' off this whole time, and if he gets a waffle maker and I don't, I'm gonna take him down." When the frenzy began, people dived in to grab what they wanted. Unfortunately for my face, some people grabbed the hard cardboard boxes and swung them back to meet my open eye. My open eye hates visitors into its home. Turns out there were more than enough waffle makers, so thankfully, my brother did not get cut by the waffle-maker-crazed woman. Next we headed to Target, to stand in line for a decent two hours. There was nothing we needed at Target either, but if we were already out, why not stay out? At midnight the line ebbed into the store at a rate of 30 people per 8 seconds (I am not making that up.) The line quickly formed into a mob, yelling at people trying to cut. One lady tried to rip my mother's arm away from me, which I responded to by yelling, "I'll never let you go, mother!" I ended up letting her go like Rose letting Jack go off of the door floating in the middle of an ocean full of cold people. True story. My face is okay now, even though it was smacked again by a 52" TV while I was innocently looking at DVDs. I guess Modern Family is a popular show. Sometimes, when I get sad, I eat food. But I don't cook or bake it myself. It was a sad existence there for a while. But I'm back. 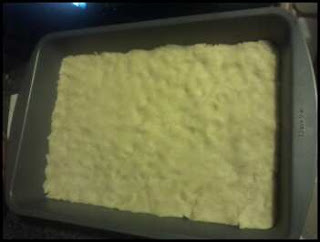 I made shortbread! And no joke...this is a fantastic idea for if you are snowed in and only have the basics of baking. 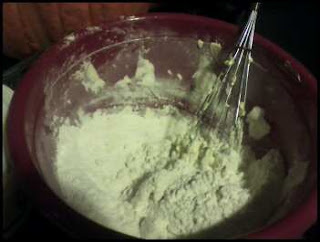 Add the butter into the mixture. Use your fingers or a processor or whatever you want to blend it. When it is mixed enough, dump it into a cake pan and press it out to fill the whole bottom of the pan. Stick it in the oven and bake it for about 30 minutes. Once you take it out and it cools for a few minutes, sprinkle as much sugar as you want on top. Be sure to cut it up before it cools all the way too. Here's a little picture from a few weeks back--Caleb got the chance to preach at a church near where we live. My brother and sister-in-law came along as well! We all wore blue...completely on accident. This Halloween, I got to have a first--I carved my first pumpkin! It was WAY easier than I expected, although my arm became fairly sore after carving out the Green Lantern symbol and a moustache man. And then...there was a Hallo--uh--Fall Festival party at the RFC! Caleb and I went as the Publisher's Clearing House man and a lady he just woke up. Does it not make sense? You're probably under 22. Lots of other people dressed up as well, even a guy as James Bond. And that isn't even a staged picture. By the end of the night, I had crashed from my sugar high, had trouble adjusting to bright lights outside of the Haunted House, and I had been shot--accidentally--with an air soft gun by a friend who thought it was a water gun.